Note: The engineers aren’t frowning. They just aren’t necessarily smiling. When communicating with an engineer, it is good to communicate how they communicate. The other option is to wait for the engineer to learn your language of words and sensitive sharing, but I will tell you this – light from the most distant galaxy that is just leaving now, may well arrive to our planet before that happens. So, it is good for you to learn a little of how to communicate. For example, engineers like charts, tables, equations, and graphs. If that is how everything is communicated, that would be well them. To explain this with a real-life situation, let me direct you to our home, and our dog. He needs fed and taken outside at least twice a day, in the morning and in the evening. My wife and I will do these duties while the other person is sleeping or still at work or not in the house for some other reason. Therefore, it is good that we communicate if we take care of the dog. My wife, a non-engineer, will sometimes write a note, using way too many words or phrases that can be misunderstood. Then, in the morning, when I took care of the dog, I wrote in the date, and put a check mark under “Fed” and “Outside”. Not meaning to brag, but this is a far more efficient, straightforward, sensible way to communicate, and it is less open to misunderstanding. Communicating the engineer way – use tables. engineeringdaze.com has some wrap-up thoughts on baseball, now that the World Series just finished the season. I was watching a baseball game recently and the team in the field brought in a relief pitcher. There was one or possibly two people on base, but he started pitching and no more outs were made when the first person he faced scored. Getting back to the game at hand, I did a quick calculation and figured, since there were no outs yet, something was terribly wrong. It looked like they were about to take this relief pitcher out of the game, resulting in him with an earned run counted against him, and no outs. That means his earned run average (ERA) for the day would have been either, impossible to calculate, because one would have to divide by zero, or, to make it a little more acceptable, infinity! Technically, it is impossible to calculate. “If a pitcher has an earned run counted against him, and he has not gotten any outs, then he will play until he gets an out, or, if he is leaves the game, an out will be charged to the other team.” In order for teams to not yank players just to get an out, then their team would start with two outs the next half inning. Engineers can add so much logic to the game. Because, believe me, dividing by zero is not logical. Thankfully, they let the pitcher get one out before taking him out of the game, and then with two runs against him, he ended the day with an ERA of 54.00. At least it was not infinity. x2 + y2 = z2 et. al. First, engineers use this equation to break down vectors into component vectors in an x-y coordinate plane. This is extremely powerful since vectors can represent forces or distance or velocity or a myriad of other phenomenon. I know. Wild, isn’t it? Engineers use Pythagorean’s old equation for great uses. And here we see the second reason why this should be principally an engineering concept. I have a brother. He just had a birthday yesterday. But, that is irrelevant. What is relevant is that he is a math professor and as a mathematician the one thing he hates is to do anything “applied” with his math. He likes to keep it “theoretical. What? No real world solutions? – No. No solving a practical dilemma? – No. No serving the general public and supplying clean water, electricity, motors, highways, etc.? – No. My brother sees math as an end to itself. He hardly even deals with numbers anymore. So, here the engineer is found to be far more noble and distinguished than the math professor. Sit and think about math, or use equations such as the Pythagorean Theorem to solve problems and help humankind? I think the answer is quite clear. Once again, it does not surprise me. My wife has a friend who is married to an engineer. This friend has been wanting a new car for a long time and her husband, an engineer, has been seen as dragging his feet on the issue. This is not the case. Now, I don’t ever want to get into the middle of a marital disagreement, but the fact that her husband is an engineer means a few things. 1. He understands that any present car they have, though over 10 years old, is paid for. It is not costing them monthly payments or a huge chunk of a savings account. 2. Only when the repair rate of the older car reaches that of the rate of all the costs of a new car is it worth buying a new car. 3. New cars cost more in insurance. 4. New cars cost more in registration taxes (if the state has it, ours does). 5. It will take a while to develop the spreadsheet of features, dealers, makes and models, car reviews, mpg rates, repair records, cargo space, safety ratings – to name just a few. It is this spreadsheet that will take the real time. The old car will rust out faster than it takes to create, test, and tweak this spreadsheet. The old car may break down numerous times before the spreadsheet is complete. But, here is the important thing to remember. Once this spreadsheet is done, the decision will be a well-reasoned one and, geologically speaking, a quick one. They should have a new car by this time next year. Or the year after. This week on engineeringdaze.com, we will pull together in one week some of the posts that were written to inform and to promote the metric system, an incredibly obviously superior system of measurement to the one we here in the United States use. Here is a simple bar chart that says it all from the perspective of most engineers. If you didn’t know, the USA is represented on the right, one of the three countries that does not use the metric system. 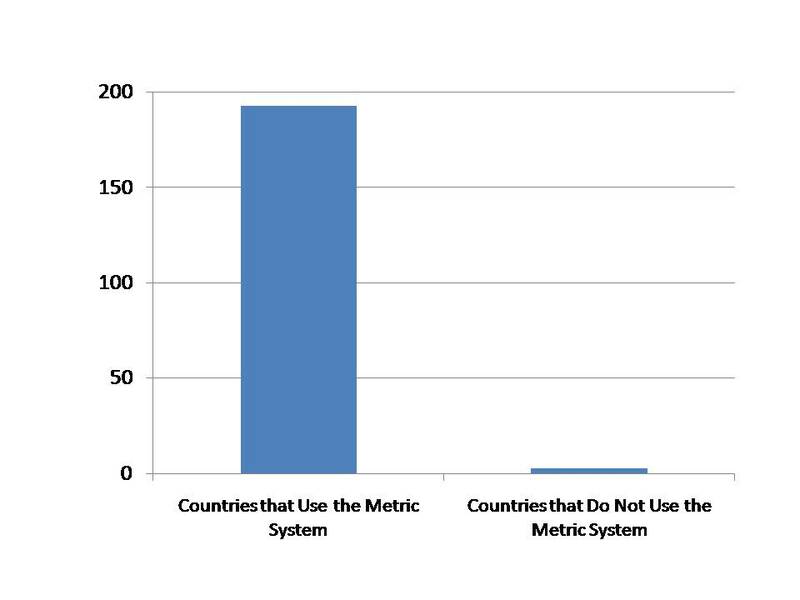 There are approximately 193 countries (depending on how one counts countries) that do use the metric system. It’s us, and our friends in Liberia and Myanmar.